Kim the Dezolisian looked around at her companions as they waited patiently outside of the inner sanctum of Esper Mansion. The first person she laid eyes on was Freyna the andriod. Apparently, she was around almost two thousand years ago when the Profound Darkness was destroyed. She doesn't appear that old, though, the green woman thought to herself. Unaware that she was being watched, Freyna braided her hair and sang to herself to pass the time. It was a tune unrecognizable to Kim, but the style of it sounded old. Looking away from the short android, Kim's eyes fell upon the other robot, Searren, who was leaning against the wall a few feet away from Freyna, studying her intently. After a few seconds of studying Freyna, Searren would then look at himself as if making comparisons. The Dezolisian chuckled to herself, amused by Searren's wonder. She then turned her attention to Quincy, the prince with the heart of a child. He happened to find a child in Esper Mansion (most likely a young esper) and was entertaining him. Kim smiled as she watched Quincy hold closed fists in front of the boy, telling him to guess which hand held a meseta. The boy chose the right hand, which was revealed to be empty. The prince then opened his left hand, which was also empty, then reached in the bewildered boy's pocket and pulled out the coin. It's amazing that he's calm after seeing his mother in the condition she's in, she thought, then she shook her head and told herself, He's not that great, Kim! I bet he is selfish like all of the other men! Yet, something deep within her refused to believe it. Suddenly, she noticed that something was different about him. The hat! She remembered. The small black fez-styled hat that the prince normally wore was missing from his head. Scanning the room, Kim found it in one of Searren's hands. Curious, the Dezolisian walked up to Searren. "What's with the getup, Searren?" she asked, "Why does Quincy insist on wearing that hat instead of a prince's crown?" The cyborg responded, "This cap is valuable to him. It was a gift from one of the children at home. That's why he isn't wearing it now. When the prince has a plan to do something reckless-- something that has a demand for haste or danger-- he hands it to me for safekeeping." Kim wrinkled her brow. What could he possibly be doing that he would need to hand off his hat? As if on cue, Quincy ran by, chasing the esper child in a game of tag. Not looking foward, the prince collided with one of the inner sanctum guards. Quincy recovered quickly, apologized, and walked into the secluded section of the Esper Mansion without looking back. Realizing what had just happened, the guards ran in after the prince. "Stop!" shouted the guard that was knocked over, "You're not allowed in! Lutz does not desire an audience right now! We told you to wait and he'd come out to see you!!" Quincy didn't respond, but instead continued on his way to Lutz's quarters. Taking advantage of the confusion, Freyna and Kim ran in after the guards with the hope of seeing Lutz thenselves. Searren, on the other hand, didn't budge an inch. The prince made it all the way to the lowest level before stopping to survey his surroundings. He had, by chance, found the secret passageway to the Cavern of the Sacred Sword hidden within Lutz's room. He stood for a minute to let his eyes adjust to the darkness. As soon as he felt comfortable, Quincy walked deeper into the cave until he found the statue of Alis Landale. Her hands were cupped around an invisible object. "Maybe she was holding something a long time ago," he muttered to himself. As he turned to leave the statue and search around the cave more, he heard a voice. "What brings you down here?" Startled, the prince pulled out his twin knives. The voice spoke up again. "Knives, huh? You don't seem to be the type of hero that would normally be down here. State your business. What brings you down here?" Quincy gripped his knives tighter. "I'm prince Quincy de Lachute. I just wanted to find Lutz so he could help my mother, so if you're Lutz, please come out." A spirit appeared in front of the prince. "Lutz isn't here. Sorry!" The spirit was the owner of the mysterious voice, but something about its appearance that was familiar to the prince. Quincy ran the faces of everyone he knew in his mind before he realized that the spirit looked exactly like the statue he had just seen! "Are you that girl that the statue was made for?" "Yes, sir prince, I am Alis Landale." The prince's eyes widened, then suddenly as if waking from a dream, he asked, "Question." The spirit of Alis giggled. "I am the first person to ever encounter and defeat the dark force. That is, I along with Myau, Tylon, and Lutz." "Lutz? His name keeps coming up, but I seem to be the only one who doesn't know who he is." Alis smiled. "Lutz is one of my closest friends and my mentor. He is a magician who has orchestrated many things in Algol. First of all, he is the founder of the Esper Mansion and the espers are his disciples. I have also heard that he created an easy to learn form of magic called techniques. Another accompishment -- and a major one, I might add-- is his telepathy ball, which is the material form of his will and memories. Every generation, a new esper inherits the memories of the Lutz's of the past and carries the task of overseeing the well-being of Algol." "Lutz's of the past? So there is no real Lutz?" "I understand that this is a difficult concept to grasp, sir prince, but there is only one Lutz. He existed in my time, then to ensure that someone was aware of the events of the past, he stored his memories, skills and knowledge for someone to inherit. The successor was given the title 'Lutz' because Lutz's being exists inside of him. So in a way, Lutz is still around, and the one that you are searching for is the same one that I fought with... just with a different body." Quincy nodded his head dumbly. The spirit placed her hands on her hips. "I think that I can trust you, sir prince, so I'll give you something. You have to promise to keep this a secret, okay?" "Secret. Promise," the prince answered as the spirit handed him a well preserved sheet of paper. Quincy looked it over, then tried to open it. "No! You can't open it, either! You must only pull this out to give to Lutz. No one else. Lutz only, okay?" "I can't tell you what's inside. It'll be revealed when it gets revealed, okay?" The prince looked perplexed. "How did you know what I was going to ask?" "Lucky guess. "Alice smiled again, then motioned toward the entrance. "Now get moving; you're trying to find Lutz, right? Knowing him, he's probably holed up in a cave on Motabia." "Motabia?" 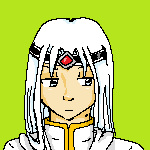 the prince groaned, "We just left from there!" Despite his complaints, though, the prince made his way to the entrance. Carefully, he replaced the wall in Lutz's room and quietly walked toward the front door. No one was around. Quincy then walked up to the gate and, seeing Searren, signaled for the cyborg to create a diversion for him. Searren walked down the hall and within minutes, a crashing sound and shrieks rang through the halls of Esper Mansion. The guards, startled, ran to find the source of the noise and Quincy quickly made his way down another hall. The prince shuffled his way out of Esper Mansion, avoiding espers along the way. Within minutes, Freyna and Kim walked outside of Esper Mansion behind the black cyborg. "Quincy! There you are!" Kim exclaimed, "I thought you were arrested! What was that all about? Did you get tired of waiting for Lutz or something?" "Yeah. Standing around ain't my style," the prince answered while recovering his hat from Searren. "And now I know that our best bet is to go back to Motabia." The women exchanged glances and silently agreed to go along with the plan without question. "The only thing I have to say is that you all will have to stay in my house until the storm subsides," Kim said. "Fine with me!" the prince answered, and he climbed into Kim's tour buggy. The rest of the team followed suit. As the Dezolisian steered her Dezomoles to her abode, the price grinned from ear to ear and asked, "Searren, how'd you create that diversion, by the way?" The black cyborg answered straight-faced, "In the process of creating a diversion, I accidentally walked into the women's shower room." The prince's bellowing laughter echoed across the skies of Dezolis. Last edited by doncair99 on Thu Jul 4, '13, 10:39 pm, edited 1 time in total.